In a large bowl, cream together the butter and sugar. Beat in the yolks one at a time, then stir in the vanilla. Combine the flour and salt; stir into the creamed mixture. Shape dough into logs about 2 inches in diameter. Wrap in waxed paper and refrigerate or freeze until firm. Preheat oven to 350 degrees F (175 degrees C). Unwrap rolls. You can roll the logs in nuts or sprinkles before slicing. Slice into 3/8 inch wide slices. Place slices 2 inches apart onto ungreased cookie sheets. Bake for 8 to 10 minutes in the preheated oven. Do not brown. Remove to a wire rack to cool completely. See how to make America’s favorite cookie. I just tried this recipe out. The cookies came out so good and buttery. Delicious! The cookies actually taste like the butter cookies that come in the danish blue tin at the gerocery store. This is a very easy cookie to make. My family loved them. I did add hazelnuts to the top of some and M & M's to the top of some. Great cookie for Santa. I made these cookies one night after work for a sweet bite to eat and fell in love with them! They are very simple to make and SO good! Precisely what I was looking for. Excellent party cookie when rolled in multi colored sprinkles. To tint, add food coloring to butter mixture, it's hard to complete once the flour is added. 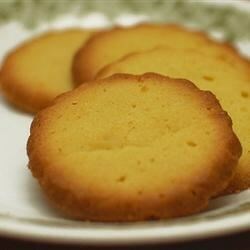 These cookies are GREAT, I love butter shortbread cookies and these were the closest to it. There were easy to make, put away the cookie presser. This is my #1 Butter Cookies.